The six different Getting-Started video tutorials explain the main functions of the CAR ASYST APP. From connecting the interface with the app to displaying detailed vehicle functions, the videos contain important insights. 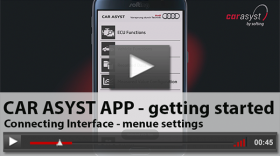 The next six videos explain the main functions of the CAR ASYST APP. Go directly to our Youtube Channel CAR ASYST!